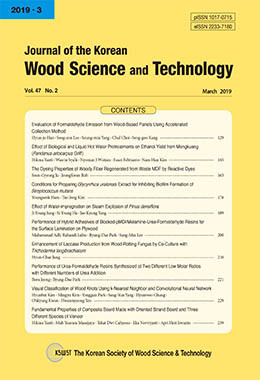 This paper examines the classification of five coniferous species, including larch (Larix kaempferi), red pine (Pinus densiflora), Korean pine (Pinus koraiensis), cedar (Cryptomeria japonica), and cypress (Chamaecyparis obtusa), using near-infrared (NIR) spectra. Fifty lumber samples were collected for each species. After air-drying the lumber, the NIR spectra (wavelength = 780-2500 nm) were acquired on the wide face of the lumber samples. Soft independent modeling of class analogy (SIMCA) was performed to classify the five species using their NIR spectra. Three types of spectra (raw, standard normal variated, and Savitzky-Golay 2nd derivative) were used to compare the classification reliability of the SIMCA models. The SIMCA model based on Savitzky-Golay 2nd derivatives preprocessing was determined as the best classification model in this study. The accuracy, minimum precision, and minimum recall of the best model (PCA models using Savitzky-Golay 2nd derivative preprocessed spectra) were evaluated as 73.00%, 98.54% (Korean pine), and 67.50% (Korean pine), respectively.